Once your BizTalk solutions are developed and taken to production, you get into the phase of supporting them and operating them on a day-to-day basis. At this point, your support staff experience various challenges on an ongoing basis. The standard tools like BizTalk Administration Console is not designed or appropriate for support/operational activities. It lacks lot of basic functionality like fine grained user access, keeping audit trail of activities performed by support staff and so on. Also in some cases, the standard BizTalk admin console is way too powerful to hand over to inexperienced or non-BizTalk people. The other challenge is on the BizTalk Monitoring side; once your BizTalk solutions are deployed into a production environment, it's important you keep an eye on the health of them. For example, you need to get notified if a receive location is down or a host is down and so on. Right now BizTalk customers need to rely on some external tools like SCOM (System Center Operations Manager), HPOM etc. SCOM comes with very good management pack for monitoring BizTalk server, but the challenging part is in the complexity of setting up SCOM and ongoing management of alerts when your BizTalk applications starts growing. We identified all these challenges faced by various customers in the past 10 years. Every time we visited a customer, they always built some kind of custom management solutions on top of BizTalk to address all these challenges. That's exactly the scope of BizTalk360. It's a single operational and monitoring solution for Microsoft BizTalk Server, to make your life easy once you have your BizTalk solution in production. Each year we bring 3 to 4 major releases, which brings the number of features over 70. Here, a number of the most important features are mentioned. BizTalk360 comes with very sophisticated security mechanism. Customers will be able to control things like providing read-only access, restricting users to certain applications, etc. BizTalk360 also audits all the activities performed by the support user. For example, if someone stops a host instance, that action is recorded. BizTalk360 also comes with full monitoring capabilities required to keep the environment healthy. For example, if a send port goes down or if you are not receiving the volume of messages you expect, and so on, it will send notifications via email, SMS etc. BizTalk360 also makes it possible to certain extent to bring your business users to support your BizTalk solutions. The UI can be completely customized and made simple, so that it's easy to train your business users to perform some simple support activities like checking the port status, suspended instances etc, either in read-only mode or can give selective permission to do so. BizTalk360 comes with lot of dashboards, productivity tools like advanced event viewer, throttling analyser, Backup/DR visualizer, message box viewer integration etc. The tools are also designed to help support people to perform their activities in a seamless way. BizTalk360 provides advanced knowledge base management system where all your operational challenges can be documented. The system will match the appropriate documentation at run time and make it visible. There are over 50 features targeted towards operations and monitoring of BizTalk Server in BizTalk360, making it an invaluable tool for customers using Microsoft BizTalk server. The below diagram shows the architecture of BizTalk360. REST API Layer (JSON) This is the transport mode between the web interface and the server environment to collect any information. BizTalk360 Monitoring Service The BizTalk360 Monitoring Service is a separate Windows NT Service. 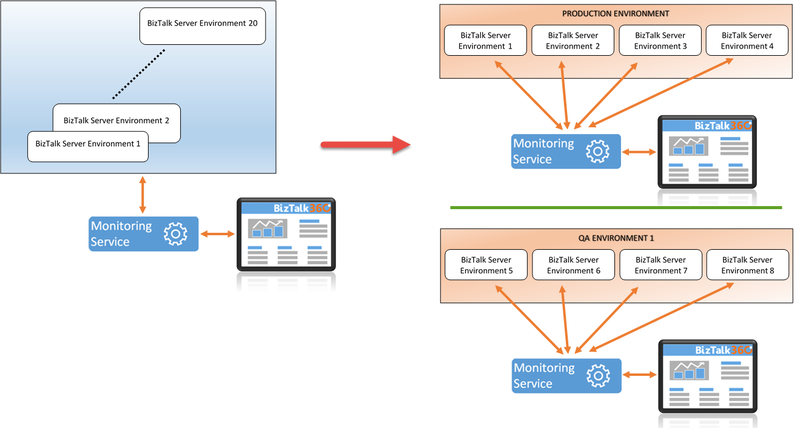 The responsibility of the monitoring service is to pick up the configuration information from the BizTalk360 database (that is saved by the user from the web interface) and perform the checks in the BizTalk server environment. It is also responsible to send the notifications through the channels specified by the user and storing the state information in the BizTalk360 database, if required. BizTalk360 Analytics Service The BizTalk360 Analytics Service is another Windows NT Service. This NT service is responsible for, amongst others, collecting Throttling data from PerfMon, collecting Tracking data for identifying Messaging Patterns, retrieve performance data on processed messages and collect data for the BizTalk Reporting feature. BizTalk360 Database The BizTalk360 database mainly contains the configuration information such as number of BizTalk server environments, security information (like User Access Policy), monitoring information based on the configuration that is the set by the user in BizTalk360 application and so on. For e.g., when the user is creating an alarm to monitor the state of a receive location, only the Expected state information is stored in the BizTalk360 database. The actual state is retrieved from the BizTalk databases. Also, in case of operational activities (like retrieving the state of host instances and so on), BizTalk360 does not persist any of the environment information in BizTalk360 Database and the information is directly rendered in the web interface. The following are the key characteristics of BizTalk360 architecture. Agentless architecture In practice, most of the monitoring solutions require an agent to be installed in the BizTalk server environment. The agent is responsible to collect the information from the environment and store it in a centralized database. BizTalk360 does not require any agent to be installed in the server environment. 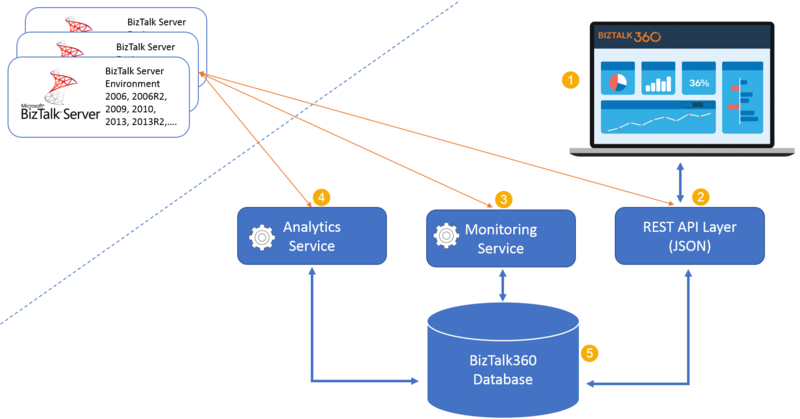 We have made our architecture so simple that you can simply install BizTalk360 on a separate server and point it to the BizTalk environment. The service account under which the Monitoring Service, the Analytics Service and the IIS Application Pool are running should have the necessary permissions to access the remote BizTalk server environment. 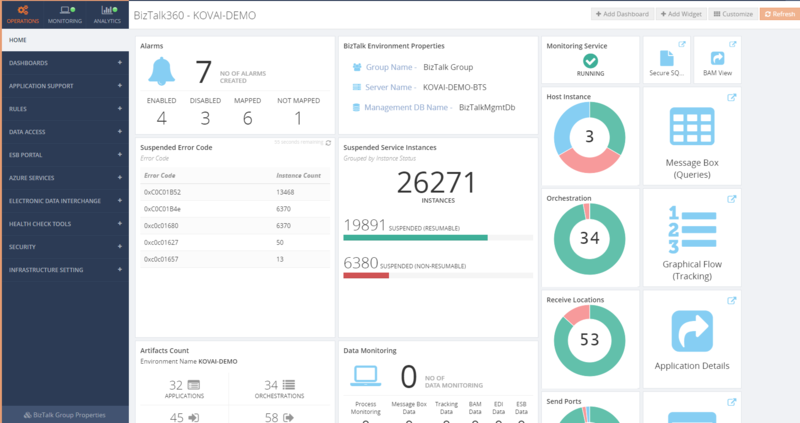 Centralized monitoring solution With a single installation of BizTalk360, it is possible to configure multiple environments without installing any agents. 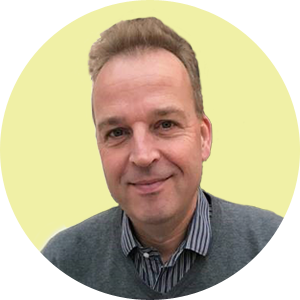 Scalability One of the drawbacks of having a central monitoring solution is the lack of ability to scale after certain extent. For instance, it is not practical to set up 20 environments with a single installation of BizTalk360 and ask the BizTalk360 Monitoring service to monitor all the 20 environments. With BizTalk360, we perform scaling at the "environment level". You can set up multiple installations of BizTalk360 for a specific purpose like Production, QA, and so on. So instead of having 20 environments in a single installation of BizTalk360, you can have 5 installations (instances) of BizTalk360 and configure every instance to have few environments.